confusion art studio - Cabinet hardware designed and manufactured in the USA! Affordable Hardware for the Do-It-Yourselfer!EASY TO BUY online! Safe and secure payment via PayPal. Just e-mail us with your order and we'll send you a return e-mail with order details and a PayPal link for easy payment! You do not need to have a PayPal account; just click on the PayPal link and use your credit or debit card to pay. Your order will ship within 48 hours of receiving payment. Cabinet hardware designed and manufactured in the USA! Affordable Hardware for the Do-It-Yourselfer! EASY TO BUY online! Safe and secure payment via PayPal. Just e-mail us with your order and we'll send you a return e-mail with order details and a PayPal link for easy payment! You do not need to have a PayPal account; just click on the PayPal link and use your credit or debit card to pay. Your order will ship within 48 hours of receiving payment. Perfect for the woodworker, ceramic artist, glass artist or even the rock artist who wants to add their own special touch to their cabinetry! Unlike other readily available hardware which we found to be too clunky or too ornate, and very expensive, our custom engineered hardware has a substantial surface to adhere glass/ceramic/wood faces, a sleek unobtrusive look, and a good 'feel'... and it's reasonably priced! NOTE: Kits do not include standard 8-32 screws for attaching hardware to cabinet front... most people use the screw from the hardware they are replacing. 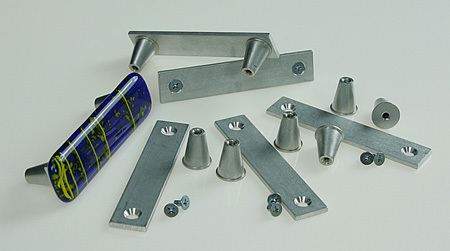 Aluminum knob bases are 5/8 inches in diameter on the adhesion side and taper to 5/16 inch. They are 3/4 inch long. In the photo, the glass was cut 1 1/2 inches square. Aluminum pulls are 3 3/4 inch long by 3/4 inch wide. Holes are drilled 3 inch on center (American standard). 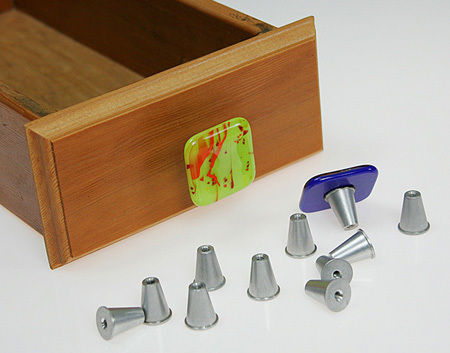 Hardware kit includes enough knob bases, drilled flat strips and screws to build 5 complete pulls. Cut your glass a minimum of 1 inch by 4 inch to cover the aluminum base plate. While developing this line of DIY knob and pull hardware, I experimented with lots of glues. Several adhesives passed the test... including rear view mirror adhesive (black) and windshield glue (obtained from our auto body friend)... but the best was a Loctite product: E-30CL - Hysol Expoxy Adhesive. Only problem is, it needs a $70 applicator gun, so if you are not making a lot of cabinet hardware, that's hard to swallow. * However, I have found a product that works well and is available in small quantities at a good hardware store: Devcon High Strength 5 Minute Epoxy specifically made for glass. No applicator gun is needed. For the pulls, GE Silicon (outdoor use) can be used successfully if left to cure for 24 to 48 hours. * UPDATE!! If you are doing a lot of knobs, check out McMaster.com for Loctite E-30CL adhesive, Mix Ratio 2:1 (#6430A23) and dispensing gun (#74695A71)!! Prices are reasonable! And there is no need to buy the nozzles; you can use the adhesive straight from the cartridge and seal back up until next time. Insert cartridge into dispensing gun. Remove cap and dispense a small amount of adhesive on a piece of cardboard. Wipe away excess adhesive and replace cap to store. Mix adhesive thoroughly with a toothpick. Pick up a small amount of adhesive on the toothpick and apply to CLEANED knob base. Take a second knob base and "spin" against first knob base. This evenly distributes the adhesive between the two knob bases. With decorative glass faces lying face down on table, position knob base on back side and twist slightly to evenly distribute adhesive between the metal base and the decorative face. Follow Loctite E-30CL recommendations for set and cure time. Avoid skin and eye contact. If using a decorative face other than glass, be sure to check adhesive specifications for your specific material. Choosing the right adhesive is important, but cleaning the two surfaces is paramount! I use sandpaper to rough up the surface of the aluminum hardware and the glass, then clean both areas with acetone before using the adhesive. I let them sit, untouched, for at least 24 hours. Once cured, even my big muscled auto body guy can't pop them loose! Your order will ship within 48 hours of receiving payment. Contact us via e-mail to purchase DIY hardware. Just tell us how many packages of each you would like to order... we will e-mail back an invoice with a link to pay via PayPal. You do NOT need a PayPal account; just use your credit or debit card.